The Enlightenment was a intellectual philosophical, cultural, and social movement that spread through most parts of England in the 1700s. How did the Scientific Revolution influence the Enlightenment? The heliocentric theory changed the way scientists thought of the Earth. No one followed the past beliefs and started looking at new ideas in the future. Thomas Jefferson was an american thinker and politician who composed the Declaration of Independence, which had been inspired by a Enlightenment thought. America and at least 13 other British colonies fought Britain. Four years after the war started, Britain gave up and declared a truce. America won independence. The French involvement in the American Revolution drove France further into debt, causing financial problems that weakened the traditional social structure. The French Revolution is a period in the History of France in the years of 1789 to 1799, when the monarchy was dethroned and total reconstruction was forced upon the Roman Catholic Church. The First Estate is Clergy are one percent of the population and they get no taxes. 10 percent of land goes to the clergy. The Clergy are the wealthiest out of the three estates. The Second Estate is Nobility is two percent of the population and has to pay taxes. They have wealth but are mostly the government, military, and country estates. The Third Estate is the Peasants, Bourgeoisie, and Sans. Peasants are poor. Peasants have to pay rent and fees.The Bourgeoisie are dwelling merchants, factory owners, and professionals. Sans are artisans and workers. The people of France were upset because of Louis XIV because he was a very wealthy but weak leader. They were having financial and economical problems. Some people in France could not afford to buy enough food for their family. Many people starved to death so the people of France complained to Louis XIV, but he did nothing. The king charged the people of France for high taxes. 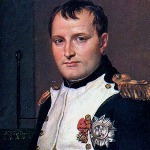 Napoleon was a French military leader and emperor who conquered a lot of Europe in the early 19th century. Napoleon successfully conducted war against diverse allies of European nations and expanded his empire. Napoleon rapidly rose through the ranks of the military. After grabbing political power in France in a 1799 coup d’état, he crowned himself emperor. After crushing a defeat at the Battle of Waterloo, he resigned once again and was sent to the remote island of Saint Helena, where he died at 51. After a tragic French invasion of Russia in 1812, Napoleon resigned the thrown. Napoleon was sent to the island of Elba. The Scientific Revolution is a time when historical changes in thought and belief unfolded in Europe. Galileo Galilei was the most successful scientist of the Scientific Revolution. He studied physics, the laws of gravity and motion, and built the first telescope and mircoscope. The heliocentric theory that the Sun is the center of the Universe. The Geocentric theory is the belief that the Earth is the center of the universe.